Rens Kortmann (1975) wants the world to be more playful. His research theme ‘Crowdsourcing the Grand Challenges for our society’ is about using games and gamification to empower citizens to contribute to a smart, inclusive, and sustainable future. Play is in our genes and has proven to be a valuable instrument to raise awareness and a sense of urgency. It has supported policy makers and other high-level decision takers to act upon issues such as climate change, energy security, and efficient transport systems. Now, Rens wants to understand how games and play may also equip ‘ordinary’ people with the attitudes, knowledge, and skills to collectively tackle the wicked, socio-technical problems they encounter in their living environments. 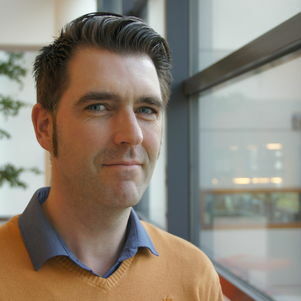 Trained as a cognitive scientist and an artificial intelligence researcher at the universities of Groningen (NL) and Edinburgh (UK), Rens received his PhD in 2003 from the University of Maastricht (NL). Thereafter he worked as a researcher/consultant for CE Delft (NL), a not-for-profit organization for environmental policy research. In 2008 he was appointed Assistant Professor at Delft University of Technology (NL). Rens is active in various committees of the International Simulation and Gaming Association (ISAGA) and of the faculty of Technology, Policy, and Management (TPM). He is a reviewer for a range of journals and conferences, organised the ISAGA game design summer school in 2014, and will organise the 48th ISAGA conference in 2017. Kortmann, R., & Luijten, A. (in press). Parsifal a Game Opera: Experiential learning in gameful performance art. To appear in Lecture Notes in Computer Science. Springer. Kortmann, R., Bekebrede, G., Van Daalen, E., Harteveld, C., Mayer, I., & Van Dierendonck, D. (2013). Veerkracht - a game for servant-leadership development. In C. Otoiu & G. Otoiu (Eds. ), The journey of change: mapping the process (pp. 129–152). Cluj-Napoca, RO: Editura ASCR. Kortmann, R., & Sehic, E. (2011). The Railway Bridge Game – usability, usefulness, and potential usage for railways management. In M. Beran (Ed. ), Changing the world through meaningful play (pp. 119 – 125). Spokane, WA. Kortmann, R., & Harteveld, C. (2009). Agile game development: lessons learned from software engineering. In G. K. Yeo & Y. Cai (Eds. ), Learn to Game, Game to Learn. Singapore: Society of Simulation and Gaming of Singapore. Kortmann, R., Postma, E., & Van den Herik, J. (2001). Evolution of visual resolution constrained by a trade-off. Artificial Life, 7 (2), 125 – 145. Kortmann, R., & Hallam, J. (1999). Studying Animals through Artificial Evolution: the Cricket Case. In D. Floreano, J.-D. Nicoud, & F. Mondada (Eds. ), Lecture Notes in Artificial Intelligence 1674 (pp. 215–225). Berlin, D: Springer. TB211A Analyse van multi-actorsystemen, 2nd year bachelor ‘Technische Bestuurskunde’ (P3, 5 ECTS). TB351B Bachelorproject, 3rd year bachelor ‘Technische Bestuurskunde’ (P1 – 4, 15 ECTS). SPM9235 Game Design Project, elective in master ‘SEPAM’ (P1, 4 ECTS). MOT1003 Integration Moment, 1st year master ‘MOT’ (P4, 5 ECTS).